​This map shows our area's Century Farms. The Century Farm Program is an award given to families who have owned their farms for at least 100 years. The program is sponsored by the State Fair of Wisconsin. The star icon takes you to images, information, and links to road views. We need more information on these sites. If you can add or correct the information please use the contact form at the bottom of this page. Your help is appreciated! 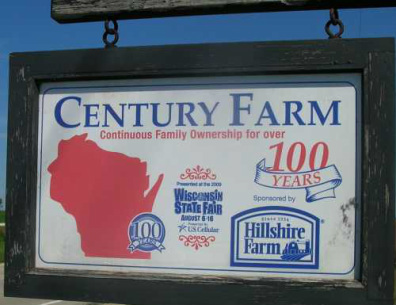 Wisconsin Century and Sesquicentennial Farms. Contact information: Century or Sesquicentennial Farm & Home Program, 640 South 84th St., West Allis, WI 53214; (414) 777-0580 Applications are due March 1 of each year.